HOUSTON — Democratic 2020 hopeful John Hickenlooper, the former Colorado governor, told energy executives at CERAWeek that "urgency" is needed to tackle climate change, but steered clear of offering policy specifics. The big picture: Hickenlooper casts himself as a problem-solving "doer" as he seeks the moderate lane in the progressive field. He often touts the methane regulation deal he forged as governor of an oil-and-gas state. Hickenlooper praised the Green New Deal while keeping some distance from it. "I support the urgency of the Green New Deal," he said onstage at CERAWeek, one of many times he used the "u" word. "It's a very ambitious and maybe excessively ambitious goal," he said Thursday evening. "I think the point of it is the sense of urgency that we have got to go hard and fast, and it is going to take all the tools in the toolkit to get to a cleaner economy." He said the "urgency" stems partly from feedback loops in which warming frees methane frozen in the tundra in Canada, Alaska and elsewhere. Where it stands: I asked him for policy plans and he demurred, saying his platform isn't ready. But Hickenlooper offered reporters some wide-angle thoughts on the sidelines of the event. He noted some U.S. emissions reductions have come because manufacturing has gone abroad. 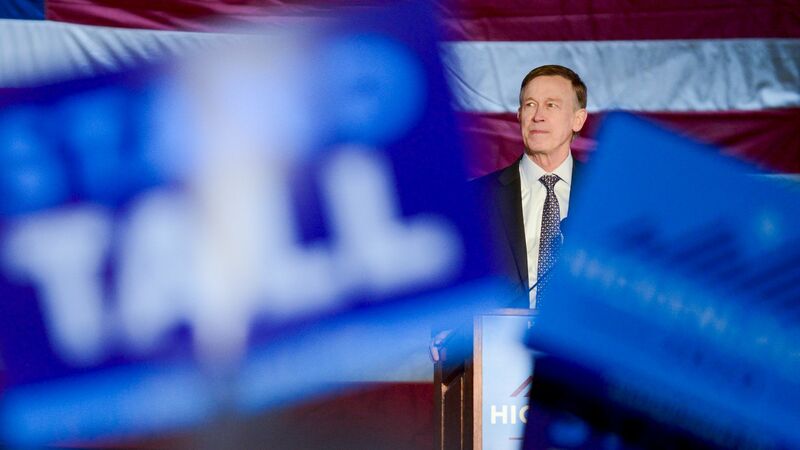 “That’s not how we want to win,” Hickenlooper said. “I think most people would say, well if we are going to build stuff, we would rather have the energy consumption here where we control it and make sure it’s greener than having that production move to Asia or the Middle East or wherever,” he added. HOUSTON — The CEO of Norwegian oil company Equinor, Eldar Sætre, spends more than half his time on climate change and is optimistic the industry will unite on the issue despite the existential threat it presents, the executive told Axios on the sidelines of a major conference. Why it matters: Equinor, partially owned by the Norwegian government, is the most progressive global oil and gas company in the world when climate change. It even changed its name last year from Statoil to reflect its transition away from oil and toward cleaner sources like offshore wind. Here are excerpts of our interview Monday at CERAWeek by IHS Markit. Axios: The Norwegian government recently announced it was divesting its sovereign wealth fund — the largest in the world — from exploration and production companies as a way to make its economy less dependent on oil. That spares bigger companies like Equinor, BP and Shell. What’s your reaction to this? "I don’t see this having a big impact on these companies. … It’s being read and interpreted in many ways, including getting away from oil and gas, but the government is very clear, it has nothing to do with that." Axios: In your speech at this conference, you talked a lot about how populism and extreme politics is getting worse. What do you mean by this? Reality check: He said he wasn’t referring specifically to any country or politician, but his description captured the dynamic here in the U.S. with President Trump. Axios: To what extent have you considered ending memberships in trade associations, such as the American Petroleum Institute, for their positions that don’t align with your aggressive stance supporting action on climate change? Axios: It takes a large amount of new investments in new oil discoveries just to keep pace with global oil demand. As you shift your portfolio, do you foresee ceasing looking for new sources of oil? "We’ll shrink our portfolio at some point. Our exploration portfolio is still growing. … Renewables displace oil and gas: We don’t have that situation yet. We do meaningful oil and gas projects, still growing it, not a lot but some, and we can still do a lot of good renewable projects." Axios: You talked a lot about how the industry can unite around climate change. But you’re a very different company than, say, ExxonMobil or EOG Resources. How can such a diverse industry get on the same page on what ultimately is a competitive space? Axios: How much time do you spend on climate change?